The Metacognition, Affective, Cognitive Experience (MACE) questionnaire was designed to assess metacognition across sleep and waking (Kahan & LaBerge, 1996). The present research evaluates the psychometric properties of the MACE. Data from two recent studies (N = 185) were used to assess the inter-item consistency, test-retest reliability, and factorial, convergent, and discriminant validity of the MACE. Results show that the MACE is a reliable measure with good construct validity. Exploratory factor analyses revealed one self-regulation and two monitoring factors. One monitoring factor emphasized monitoring internal conditions; the other emphasized monitoring external conditions. This factor structure is consistent with the Metacognitive Model (Nelson & Narens, 1990). Tests of convergent and discriminant validity suggest that the MACE is assessing metacognition and is appropriately related to similar constructs such as mindfulness and self-consciousness. The implication of these findings as well as suggestions for research and clinical applications of the MACE are discussed. NOTICE: this is the author's version of a work that was accepted for publication in Consciousness and Cognition. Changes resulting from the publishing process, such as peer review, editing, corrections, structural formatting, and other quality control mechanisms may not be reflected in this document. Changes may have been made to this work since it was submitted for publication. A definitive version was subsequently published in Consciousness and Cognition, Vol. 21, no. 1, (2012). Kahan, T.L. & Sullivan, K.T. (2012). 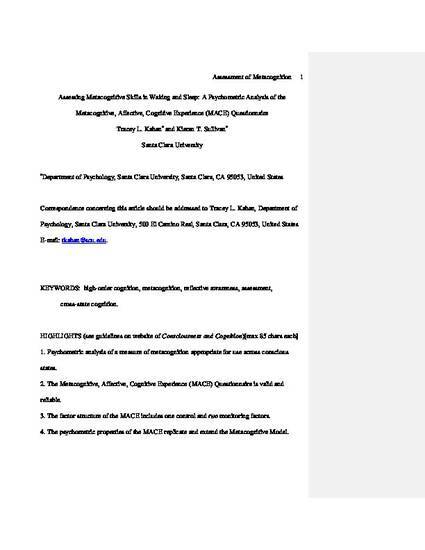 Assessing metacognitive skills in waking and sleep: A psychometric analysis of the metacognitive, affective, cognitive experience (MACE) questionnaire. Consciousness and Cognition, 20, 340 - 352.